Reach Kidney Care | Do You Have a Kidney Champion? 30 Oct Do You Have a Kidney Champion? A kidney champion speaks on behalf of a recipient’s need for a living kidney donation. A kidney champion should know the recipient well, be able to explain his/her story, and provide information regarding how to become a living kidney donor. Jasmine delivered a powerful message on February 25th, 2018, at the First Baptist Church South Inglewood. You can view her message on YouTube. If you need a kidney champion, ask your family and friends for help. Share your story. Let them know how difficult it is to ask for a kidney. Be willing to share your story on Facebook and other social media channels. Be willing to talk about it at church and at work. 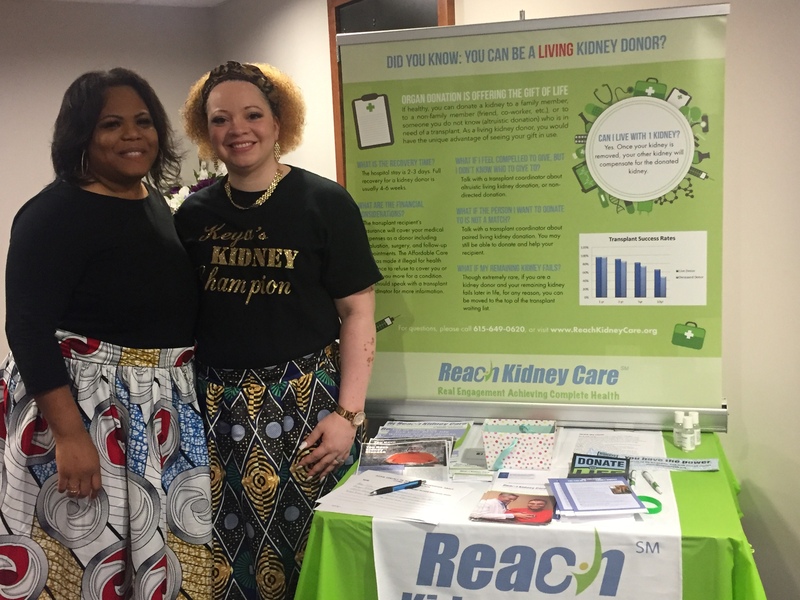 Contact your REACH Kidney Care coordinator and see if she is able to host a living kidney donation table at your church or other community spot. Markeya Douglas (Left) and Jasmine Hall (Right) standing next to the REACH booth at their church. According to UNOS, as of March 21, 2018, there are 95,249 candidates on the kidney transplant waiting list. The average wait for a kidney is 5 years. A living donor’s kidney is shown to last longer than a deceased donor kidney, on average 18 years for a living donor kidney compared to 13 years for a deceased donor. In general, to be a living donor an individual must be physically fit, in good health, free from high blood pressure, diabetes, cancer, kidney disease and heart disease. Routine tests are always performed to determine not only the potential donor’s level of physical and mental health, but also their compatibility with the patient awaiting a transplant. If someone is interested in testing to be a match, share the blood type of the recipient and the transplant hospital phone number where a potential donor can be tested.